Create and manipulate Active Areas. Active Areas provide a mechanism for restricting the scope of OOF2 operations to a portion of a Microstructure. The Active Area is defined in terms of a set of pixels, called the “active pixels”. Pixel operations will be restricted to active pixels. Operations on Skeleton Nodes will be restricted to Nodes with positions inside active pixels. Active Skeleton Elements are defined as Elements with at least one active Node, and active Skeleton Segments are those with an active Node at either end. Thus active Elements and Nodes can extend outside the Active Area. This menu contains commands for manipulating Active Areas. OOF2 maintains a list of previously used Active Areas, so it's possible to go back and reuse old areas. It's also possible to assign names to Active Areas to make it easier to store and recall them. Not all OOF2 operations respect the Active Area. Most Skeleton and Microstructure operations do (such as element refinement or pixel selection), but most Image and Mesh operations do not. In particular, none of the Undo or Redo commands pay any attention to Active Areas -- they can change Microstructures or Skeletons in inactive regions. 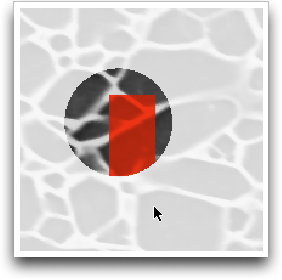 Like pixel selections, Active Areas all belong to a particular Microstructure. Activating pixels in one Microstructure has no effect on pixels in another Microstructure. It's possible to Copy an Active Area from one Microstructure to another, though. Figure 6.1 shows how the Active Area is used for pixels, Elements, Nodes, and Segments. When an Active Area is being used, the inactive pixels are dimmed in Image and Microstructure displays. (Inactive Skeleton components are not dimmed, unfortunately.) The amount of dimming can be adjusted by editing the BitmapOverlayDisplayMethod for the Active Area in the Layer Editor. A circular active area. The inactive pixels are dimmed. A rectangular selection is being made with the Pixel Selection toolbox. 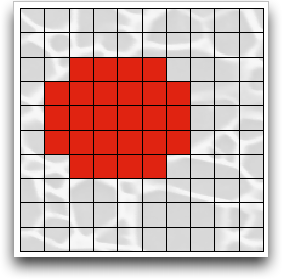 Only those pixels within the active area are selected, although the selection rectangle extended beyond it. A Skeleton has been created, and the active Nodes have been selected and highlighted in yellow. Note that the Skeleton has not been dimmed in the inactive region. All of the active Elements have been selected. Note that they extend into the inactive region, because an Element needs only one active Node to be active. All of the active Segments have been selected. They also extend into the inactive region, because active Segments only need to have one active Node. OOF.ActiveArea.Activate_All -- Activate all pixels. OOF.ActiveArea.Activate_Pixel_Group -- Activate the pixels in a pixel group. OOF.ActiveArea.Activate_Pixel_Group_Only -- Activate only the pixels in the given pixel group, deactivating everything else. OOF.ActiveArea.Activate_Selection -- Activate the the selected pixels. OOF.ActiveArea.Activate_Selection_Only -- Activate the selected pixels, deactivating everything else. OOF.ActiveArea.Copy -- Copy the active area from another Microstructure. OOF.ActiveArea.Deactivate_Group -- Deactivate the pixels in a pixel group. OOF.ActiveArea.Deactivate_Selection -- Deactivate the selected pixels. OOF.ActiveArea.Delete -- Delete a stored active area. OOF.ActiveArea.Expand -- Expand the active area by a given distance. OOF.ActiveArea.Override -- Temporarily activate the entire Microstructure. OOF.ActiveArea.Redo -- Redo the latest undone active area modification. OOF.ActiveArea.Rename -- Rename the stored active area. OOF.ActiveArea.Restore -- Restore a named active area. OOF.ActiveArea.Shrink -- Shrink the active area by a given distance. OOF.ActiveArea.Store -- Store the current active area. OOF.ActiveArea.Undo -- Undo the latest active area modification. Image modifications do not use the Active Area because they are mostly implemented by external libraries which don't know about OOF2 internal structures.